The Danish subsurface contains very large amounts of “green energy” in the form of geothermal resources that can be used as hot water for heating purposes. Today, only a small part of these resources are utilized in the three existing geothermal plants at Thisted, Margretheholm and Sønderborg. The research project has been designed to characterize and implement a nationwide, regional mapping of geological and geophysical parameters that are essential for assessing the potential for geothermal energy utilization. The temperature rises approx. 25-30 degrees per Kilometers down through the Danish subsurface. Deep geothermal energy is best utilized by producing warm water from sandstone beds with good reservoir properties located at 800 to 3000 meters depth. In this depth zone, the temperature in the starting point is high enough to be part of a district heating production and the reservoir properties of sandstones are not necessarily destroyed by diagenetic processes. Good reservoir properties mean that the sandstones have good water-conducting properties, which is the case if they have a large pore volume (good porosity) and if the hot water can flow freely between the pores (good permeability). An assessment of the geothermal potential in a given area requires, in addition to an assessment of porosity and permeability, an assessment of the thickness of the sandstone reservoirs, temperature distribution, original deposition environment, continuity, and burial history. Continuity is an expression of how coherent a given reservoir is, both as a result of the initial deposition distribution of sand in time and space, but also as a consequence of subsequent fracture zones (i.e., faults) that may have cracked the reservoir into smaller units, which each for itself does not have sufficient water volume for geothermal use. The burial history of the reservoir determines the impacts of the sandstone layers, especially in the form of mechanical and chemical transformations (diagenesis), from being deposited millions of years ago and to today. The research project has generated extensive new knowledge about the regional distribution of geothermal reservoirs, their physical recovery, temperature and energy content. This has been done on the basis of new seismic mapping and interpretation, the construction of a three-dimensional structural geological model and a three-dimensional thermal model for the underground, analysis of reservoir rocks and geophysical wellbore data as well as numerical model calculations. The many data are summarized and illustrated in the Geotermi WebGIS portal, which provides the basis for a new overall assessment of the potential for exploiting deep geothermal energy in the subsurface. 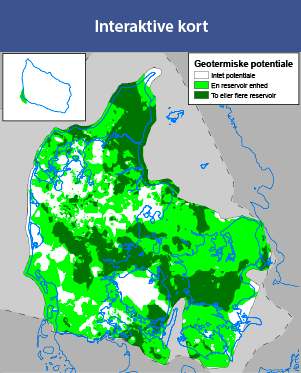 From the geothermal potential map in the portal it appears that in the majority of the country there are geothermal reservoirs in the subsurface, including under Greater Copenhagen, which are suitable for geothermal recovery. Although the research project has brought significant new knowledge, the results also point to academic fields where new research is needed in specific issues to ensure long-term stable and sustainable geothermal energy production. In the future, the interest in the mapped sandstone reservoirs that are suitable for geothermal production could be further increased. This could happen, for example, if the power power plants supplying heat to drive the heat pumps at the geothermal plants can integrate the utilization of geothermal energy with the possibility of seasonal energy storage from other energy forms in the subsurface. A more detailed review of the most important results is found under DSF-Geotermi: Results. A number of the most important contributions can be found under DSF-Geotermi: Publications.